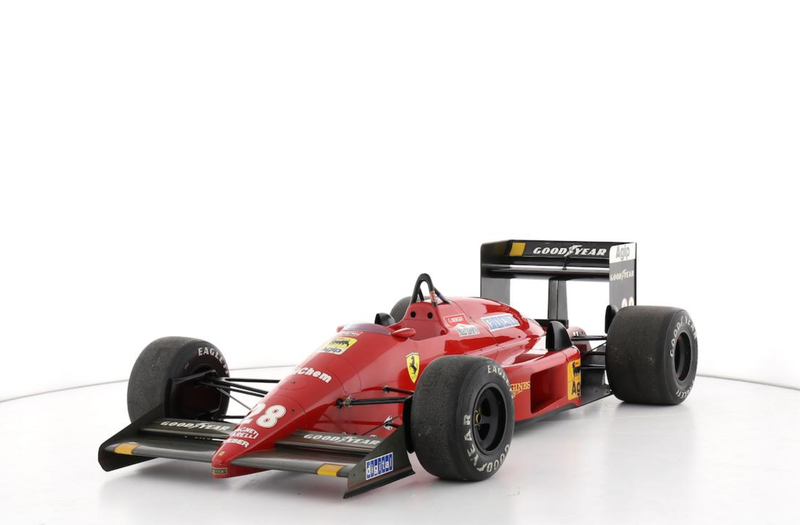 This is a pure 1980s Formula One car. The F1/87 was Ferrari’s entrant for the 1987 F1 season. Their drivers were Gerhard Berger (who won the last two races of the year in a similar car) and Michele Alboreto, who drove this one. This car, interestingly, is chassis #100 – which it means that it was Ferrari’s 100th Grand Prix car built since they started that numbering sequence in 1961. Okay, so maybe not Ferrari’s most successful chassis. And definitely not Alboreto’s most successful F1 season. This car has been on long-term static display and appears to be entirely original (because it looks like it’s been used). It is noted that a complete mechanical recommissioning will be necessary before any future use. Still though, it’s a Ferrari F1 car. In this condition, it’s expected to bring between $790,000-$1,000,000. Click here for more info and here for more from Bonhams. This entry was posted in Uncategorized and tagged 1987, auctions, Bonhams, cars, classic cars, f1, f1/87, ferrari, formula 1, formula one, race cars by classiccarweekly. Bookmark the permalink.